A really brief note on the free sheet for this physical show by National Theatre of China says it’s about the life of Zhang Qian, a famous explorer of the Han dynasty who was one of the first people to establish cultural and capital exchange with peoples as far as Afghanistan. He travelled along what is now known as the Silk Road, and is seen as a heroic figure in Chinese history. But the show has no words, the scenes are quite abstract, and so that narrative remains unelucidated. It’s impossible to work out what is going on and why. Not to worry. The piece itself is a beauty, and grows more so as it goes on. There are gorgeous scenes that symbolically recreate huge battles or Zhang Qian’s personal losses. A stick adorned with red tassels symbolises his authority, a woman in khaki-ish clothes represents his beloved horse. 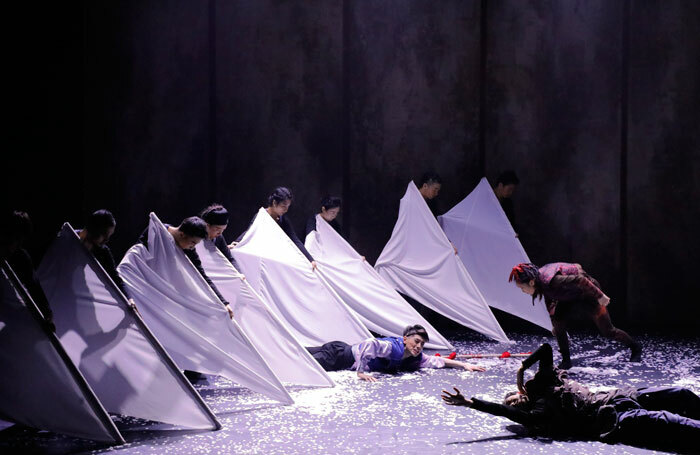 Great beasts like the war-bringing Qiongqi come alive with masks and puppets. Towards the end are some wonderful moments, especially when a snowstorm hits Zhang Qian and great gusts of confetti bury him on stage. Pan Yu’s live accompaniment on pipa and guzheng adds a haunting, atmospheric touch. It would be worth brushing up on Zhang before seeing this, but on its own terms there’s still a lot to love.